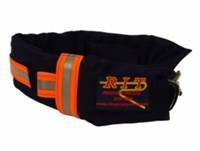 RIT Rescue and Escape Systems, Inc. was founded by Omar Jordan, a full-time Fire Fighter/Paramedic for a suburb of Cleveland, Ohio. The escape device was conceived as a result of an actual fire ground situation that nearly claimed the lives of several fire fighters. While fighting a four-story apartment fire Omar and his fellow fire fighters were nearly trapped when the fourth floor roof caved in without warning. Luckily the stairway was clear enough for an escape route. If not, the only option was to jump out a window. "There was no other way out." FFRED (Fire Fighter Rescue Escape Device) was conceived that night. After several years of research and development this system is finally on the market. 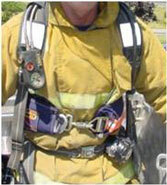 FFRED utilizes technologies and methods new to the fire and utility service. 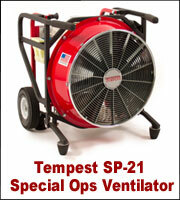 The entire device was designed and tested as a system utilizing high temperature escape line and lightweight materials. It is important that all of the components be used together as a UL certified escape system. Utilizing individual components separately will not have the same effect and could prove to be dangerous. The goal of this company is to provide reliable, affordable and easy-to-use rescue and escape systems to fire fighters, utility, industrial and public safety personnel. A safe and effective system for emergency egress, the FFRED is self contained and pre-rigged with 50' of Kevlar tubular webbing, a carabiner and a friction device. UL certified to NFPA standards, this emergency egress system weighs less than 4 pounds. the system requires limited skill and no extensive training to provide a safe, controlled descent. •862 degree F. temperature rating. •PULL OUT CARABINER, FIND A SAFE ANCHOR AND BAIL!! Available in 35', 50' or 65' lengths complete with an auto locking rated carabiner in a fire resistant Indura bag. 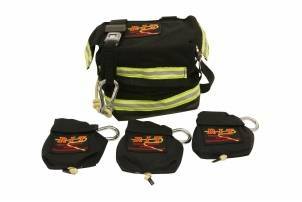 The bag can be put in bellows pocket or attached to the SCBA waist strap. All search lines are made of Kevlar tubular webbing which has a tensile strength of 5,500 lbs. and a temperature rating of 862 degrees F.
Kevlar tubular webbing is also available by the foot for custom lengths. Less bulky and considerably lighter than other search lines of the same length. RIT's Retractable Tag Line contains 20' of our 6MM Kevlar over polyester rope and is self retracting. 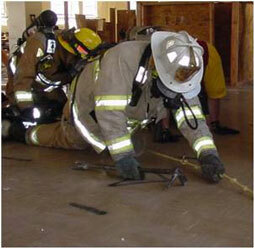 Used in conjunction with our Group Search Kit, it allows a Firefighter to make his search quicker and more accurate. All group search kits can be customized by replacing the standard tag line with the retractable tag line. Available in 100' or 200' lengths, the primary search lines are made up of 9.5MM Kevlar over polyester and two non-rated carabiners. The primary lines come in two different bag styles, our Chicago style bag and our standard bag, both are Cordura material. Primary lines have the option of being euipped with the knot and ring marker system. The ring provides a secure fixed anchor for attaching tag lines. The knot indicates direction and distance to guide the searcher. The Chicago bag comes equipped with reflective trim and utility pockets. Both bags contain a seat belt buckle for quick release. RIT's Group Search Kit makes large area search and RIT team operations a safer task. The standard kit is set up for a four person team and provides a lifeline to the outside for each member. For searching a large area the optional marker system of knots and rings assists in performing a systematic search and prevents duplication of search areas. The knot and ring system assures team members of their location and exit direction. RIT operations are also supported with this system. While searching for one of our own we have a tendency to search harder and longer than normal. Each RIT team member is not only connected to the outside, but the system also leads secondary RIT teams to their location for assistance and/or supplies. •100' or 200' Primary lines are made of 9.5MM Kevlar over Polyester rope that carry an 862 degree F. temperature rating and a 7600 pound tensile strength. •Each kit comes with three 25' tag lines.